Madrid, Spain. 13 December, 2012 — Austrian author, C.R. Martínez has published “Two Cats and a Chicken Shop Mystery”, a 250-page book that provides first-hand insight into some fascinating social phenomena from a country, hard-hit by the economic crisis. Set in present-day Spain the novel combines a variety of real-life events which places its subtle plot into a more than relevant current setting. The action kicks off in a chicken shop in Madrid where Consuelo, a 62-year-old widow, finds herself confronted with a face that suddenly appeared on her floor. Her quest to reveal the truth leads her to one of the most extraordinary mysteries in contemporary Spanish history. But was she really meant to uncover the secret? Is her quest guiding her into a dangerously new direction that could change her life forever? 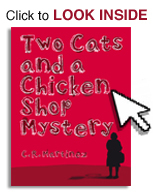 For a limited time (13 December 2012 – 13 January 2013) “Two Cats and a Chicken Shop Mystery” will be available as free download on http://twocatsandachickenshopmystery.com with the following coupon code: KD99P. C.R. Martínez is the pen name of an Austrian author who worked in humanitarian aid before moving to Spain. The author currently works as an English teacher in Madrid.